Conflicting results of two major randomized trials on prostate cancer mortality (1, 2) have led to evolving guidelines for clinicians regarding prostate cancer screening (3–6). While the European Randomised Study of Screening for Prostate Cancer (ERSPC) showed that one prostate cancer death could be prevented per 781 men screened, the Prostate, Lung, Colorectal, and Ovarian (PLCO) Cancer Screening Trial showed no mortality benefit at 13 years of follow-up (1, 2). Because of the question of mortality benefit and the possible harms of screening, the United States Preventive Services Task Force (USPSTF) initially recommended in 2008 against screening men over age 75 for prostate cancer (3) then in 2012 against screening for prostate cancer at any age (4). However, it is most recently recommended in 2013 by both the American College of Physicians (ACP) and the American Urologic Association (AUA) that screening for prostate cancer occurs through a process of shared decision making (5, 6). While it is not recommended to screen men for prostate cancer at age 70 or above, or men with a life expectancy of less than 10–15 years, for men with average risk of developing prostate cancer, these shared decisions should occur between physicians and patients for men starting at age 50. For those men with high risk of developing prostate cancer, including men with a family history of prostate cancer or African-American men, these conversations could start as early as age 40 (5, 6). Most of these shared discussions will initially occur between men and their primary care physician. Previous reports of decision aids for prostate cancer screening have shown improvement in patient knowledge and in decisional conflict as well as satisfaction with the decision (7). However, it is also known that patients may be more likely to be aware of the benefits of screening decisions and not the harms, and may ultimately rely on the physician’s recommendation, and it is not clear if the use of decision support alters prostate-specific antigen (PSA) testing behavior (8). Indeed, the rates of PSA testing were reduced in older men after the initial USPSTF recommendations (9–11) and in men over age 50 after the 2012 recommendations (12). However, is it not known to what extent shared decision making contributed to the decreased screening rates observed, whether shared decision making is occurring more frequently since the ACP and AUA recommendations were released, or to what degree patient or provider factors have contributed to the decline in screening rates. Barriers to shared decision making regarding prostate cancer screening include lack of time for discussions as well as physician and patient factors (13–18). Patients may address an average of 25 problems during some chronic care and primary care visits (19), and cancer screening discussions may not be prioritized when management of multiple chronic diseases is also needed during the same office visit. More importantly, primary care physicians do not readily have access to tools that can promote shared decision making for prostate cancer screening. Elwyn et al. have proposed a model of “choice, option, and decision talk” to be used for shared decision making conversations in the clinical encounter (20). For a complex decision, such as prostate cancer screening, we propose the use of a simple tool in a routine outpatient encounter to begin this discussion, to accomplish the first two steps of this model: (1) make the patient aware that he has a choice and (2) begin to consider the options. We suggest that the decision is discussed after the patient has had appropriate time to consider the choice and options. This step may occur within the same visit or at a later time. We propose shared decision making for prostate cancer in a primary care encounter is based upon nine constructs incorporating risk for prostate cancer and patient preferences. The risk for developing prostate cancer increases with age. The median age at diagnosis is 66 (21). However, screening at age 70 or above is not recommended (5, 6), based upon life expectancy (22). A family history of prostate cancer increases the relative risk of prostate cancer in a man with a first-degree relative with prostate cancer to 2.48, with a higher risk in men younger than age 65, or if the man’s brother had prostate cancer, and greater risk if more than one first-degree relative was affected (23, 24). African-American men have an increased risk of developing prostate cancer compared to Caucasian men, while men from Asian and Native American or Alaskan native backgrounds have a lower risk. Hispanic ethnicity is also associated with a lower risk of developing prostate cancer (21). Data from the Prostate Cancer Prevention Trial suggest that the odds ratio for having prostate cancer is 2.47 if a man has an abnormal digital rectal exam (DRE) (25) but the sensitivity of the DRE is low. It is possible that primary physicians will not routinely have performed a DRE for risk stratification. Risk of prostate cancer is predicted by PSA level (25) with recent recommendations suggesting different approaches to men using PSA cut off levels of <1, 1–3, and >3 ng/ml (26). We propose that a patient’s self-reported rating of quality of life is incorporated into the decision to offer screening for prostate cancer. While this initial tool does not quantitatively address comorbidities, we propose that clinicians will make an assessment of comorbidities with patients during the screening discussion after reviewing the patient’s answer to this question on the tool. Urinary symptoms are a known side effect of prostate cancer treatment. Up to 14% of men can experience urinary incontinence 5 years after radical prostatectomy for treatment of prostate cancer (27–29). Assessment of the importance of maintaining urinary function should be performed as part of the prostate cancer screening discussion. Erectile dysfunction is also a known side effect of radical prostatectomy (27–29) and can affect 50% of men undergoing treatment, with slightly lower rates after radiotherapy (30, 31). Anxiety regarding prostate cancer may be a major driver in the screening decision (32, 33), and this issue should be addressed prior to making a choice to proceed with screening. 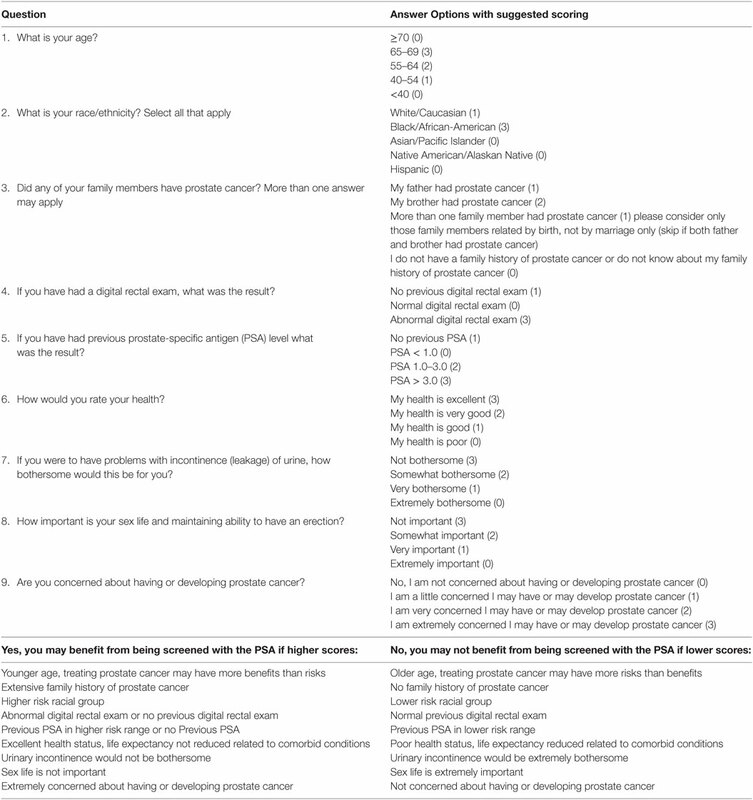 While we understand that the decision for prostate cancer screening is complex, we also appreciate the limited time available to discuss this topic in a routine clinical encounter and the proposed tool is meant to begin a discussion that incorporates patient preferences and is not meant to be comprehensive. We propose a tool that can be given to patient within the clinical encounter (Table 1). Questions 1–5 address demographic or past medical history indicators of prostate cancer risk, while Questions 6–9 focus on patient preference. While we do not propose a specific “cut off” score to prompt a decision to screen for prostate cancer, we have suggested assigned points to answer options based upon our available data for each of our constructs. Table 1. Proposed screening tool and interpretation based upon constructs. It is extraordinarily difficult to use a tool like this precisely to make a screening decision due to the enormous complexity of the decision. However, we think this tool could be useful as a guide for physicians to identify men who may benefit from further discussion vs. those who may not. Extreme values on this tool may indicate decisions on whether to screen. Scores toward the center values may indicate those who will need further thought and discussion, and possibly extensive shared decision making. Ideally, a physician would introduce this tool during an office visit with a phrase, such as “I would like to make you aware of the option you have to choose to have a screening test to look for prostate cancer. Some men may choose this test while others may not based upon their preferences. I have a few questions you can answer to help think about this option. I can then provide more information for you and we can discuss this at your next visit.” An alternative would be to have a patient fill out the tool prior to an office visit with a plan to discuss the results at the time of the visit. Testing of this tool in busy primary care clinical settings is underway, and the tool will be refined with continued feedback from clinicians and patients. AM-H and MK contributed equally to the concept and design of this opinion piece. Both the authors have reviewed the final version of the manuscript being submitted. Copyright: © 2016 Misra-Hebert and Kattan. This is an open-access article distributed under the terms of the Creative Commons Attribution License (CC BY). The use, distribution or reproduction in other forums is permitted, provided the original author(s) or licensor are credited and that the original publication in this journal is cited, in accordance with accepted academic practice. No use, distribution or reproduction is permitted which does not comply with these terms.